Back in early 2013 my entire motivation for getting a 3D printer was to print knots, since that is what I usually study when I am wearing my math professor hat. Specifically, I wanted to print knots in a minimum conformation, that is, knots that were as tight as possible. Of course it is difficult to see what tight knots are doing since they are all bunched up, so many of my early prints of tight knots were "blown out" - really meaning that the strands were made thinner - so that there would be space between the strands; for example see Day 9 and Day 11. Today's conformation of 7_3 is a true "tight" conformation, pulled together as closely as possible. 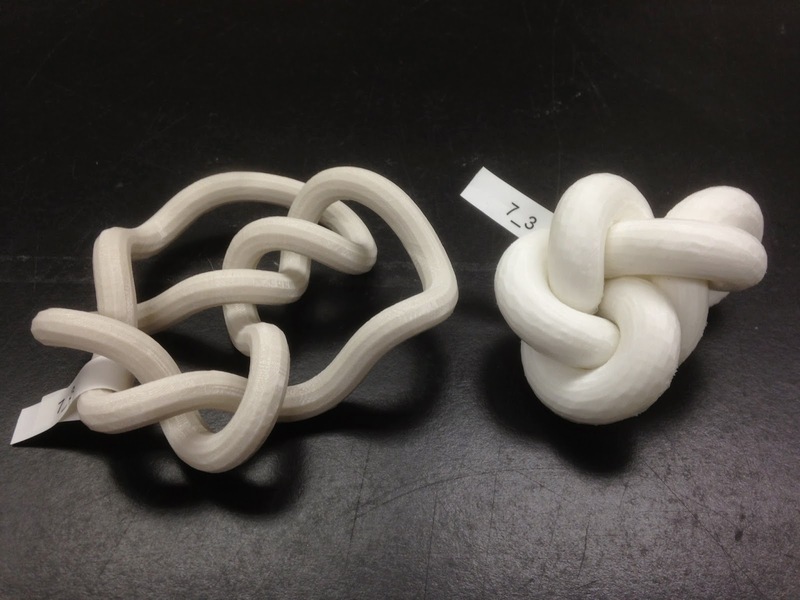 The data for this knot was kindly provided by Jason Cantarella from the Department of Mathematics at the University of Georgia, also known as DesignByNumbers on Thingiverse, where he has provided files for a very large number of minimum-conformation knots and links. Settings: Printed on a MAKERBOT REPLICATOR 2 I LOVE YOU PLEASE DO NOT BE DISCONTINUED.